Keep your eyes peeled as you head toward Providence! You are definitely likely to see some other ceramics folks heading the same way. I start looking for people I know when I get to the Kansas City Airport. In 2012, I was heading out to Seattle, walked down the aisle of the plan and ended up sitting right next to Gary Bates, our show manager from George Fern (that’s the company who handles all the setup on-site. They’ve been contracting with NCECA for this task since 2002. It so happens that the company is based in Kansas City. If you see Gary at the conference, he’ll likely be wearing a Jayhawks cap.) Anyway, I like to play a fun game I call “guess the potters” (term potters used loosely to describe anyone who works in clay, btw). It’s especially fun at the destination airport. Anyone in a suit is automatically disqualified. But I digress….. If you’re flying in to the Providence Airport, you should know that it’s technically in Warwick, but don’t worry, because you’re back east….you can go through 5 cities in a mile, which is weird for this Kansas girl….here you can go 5 miles without a city (way more than that actually)…..In this case, the Airport in Warwick is 9 miles from downtown Providence. So once you have your bags, you need to get to your hotel. There is an Airport Shuttle, but beware it only runs until 7pm weekdays, and 5pm on the weekend. It’s $11.77 one way or $23.54 round trip. You can call in advance to make a reservation. (401) 737-2868 or toll-free 1-888-737-7006. When calling for a reservation make sure you tell them you are reserving for the NCECA conference. They also have a desk available at the airport in baggage claim. http://www.airporttaxiri.com/shuttles/providence-shuttle. 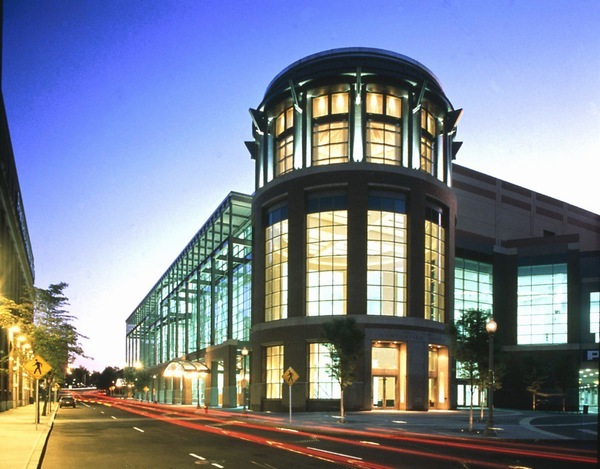 If your lodging is at the Hilton, you will need to request service to the Omni which is two buildings from the Hilton (Convention Center and Dunkin’ Donuts Center). If you fly in after shuttle hours, you can catch a cab. Taxi’s from the airport to downtown: $40-$45 one-way. OUCH! This is where the “guess the potters” game comes in handy. Seriously, I have no qualms about walking up to someone with a potter score of 12 or more and saying “Are you here for NCECA? Wanna split a cab?” Of course if you’re less bold than I am but equally “thrifty”, you can take the bus. The Number 14 Bus runs Monday – Saturday and takes about 15 minutes. The Number 20 Bus runs seven days a week but takes about 30 minutes. That’s not too bad at all….well above freezing during the day, mostly sunny (except for Thursday…but hey, doesn’t it ALWAYS seem to rain on the Thursday of NCECA?) Unless you’re from the South, 40s and 50s should feel completely comfortable. Heck, around here, that’s shorts weather! In case you can’t clearly see that, if you’re coming from the Omni, you will come into the convention center over by the NCECA Gallery Expo area. From the Hilton, you’ll enter where the Skybridge to the Dunkin’ Donuts center is. Now, here’s an important tidbit, and please help me out by passing this around. 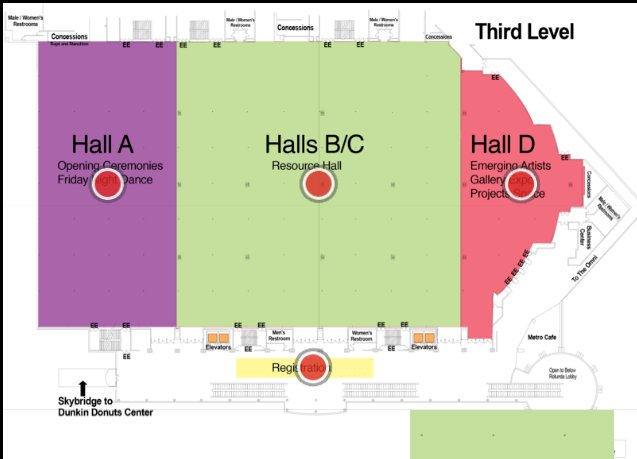 The Resource Hall will be locked on Tuesday while exhibitors are setting up. You can not get in to poke around in there or even say hi to a person you know is in there. Even if it’s your Mom. This is a change from years past. There are a couple of reasons – 1. Safety. There are forklifts moving around, pallets abound, and people scurrying all over. 2. Efficiency. Having been an exhibitor in the Resource Hall, I can tell you that Tuesday’s setup can be a whirlwind, to say the least. The commercial exhibitors have about 3-4 hours to get all of their booth display items set up, stocked up and ready for you. And they’re hungry….and hot….and sweaty, and while they are truly and honestly thrilled to see you, they also want to get their job done so they can relax and explore. We know you’re excited to see all your friends. Just give it 3 more hours…then check the bar. I bet you’ll find them. Hey Cindy, I just called the shuttle number and they told me they didn’t take reservations (I did identify myself as attending NCECA). Just thought you might want to know. Thanks Wynne, I’ll look into it and report back! Hi Cindy. How and when do vendors get the swag to include in conference bags? We have samples to give away at our booth but hadn’t realized there was a swag bag option as well. 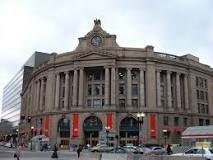 Hi Cindy, Even the though the weather will be in the forties, everyone should know that the wind in the DownTown Providence area can be really nasty. Something about the configuration of buildings and streets and water! When I was in Indianapolis five years ago for a Potters Council workshop it was cheaper take a Carey Limousine to the motel than a cab. I think it was a special offered, but people might want to check it out. I have found the RIPTA busses are as good as any way to get into the city from the airport. Rush hour traffic can be a mess up no matter what form of transportation you are using. Thanks for the advice! So wonderful to have such great information shares directly from the locals!! !